Editor Mark Miller, a new Rotarian, talks to incoming District 5100 governor Larry Hatch about the event. 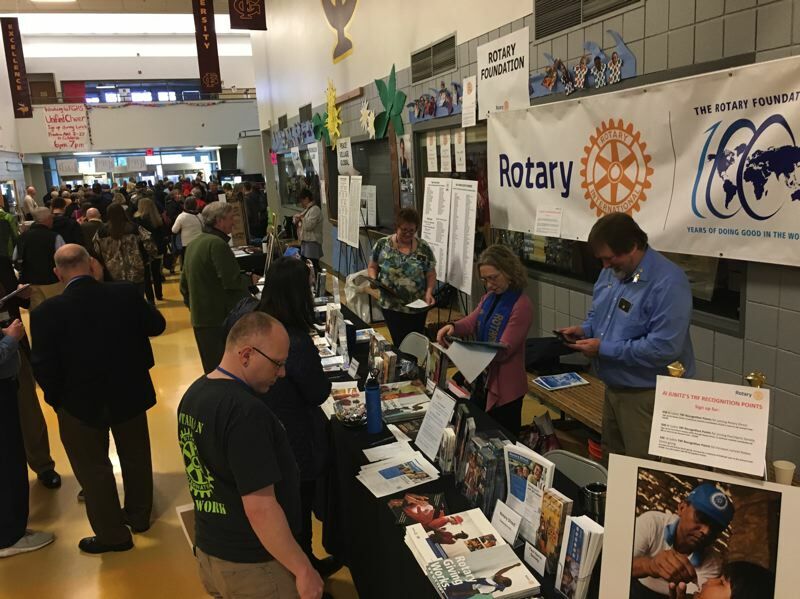 Forest Grove High School became a mini-convention center this past Saturday, April 14, as Rotarians from across the region came out for this year's district training assembly. I recently joined the Rotarian ranks, becoming a member of the Forest Grove Daybreak Rotary Club earlier this year. News-Times and Hillsboro Tribune publisher Nikki DeBuse and her predecessor John Schrag, now the executive editor for the Pamplin Media Group, participate in the noon club here in town, the Rotary Club of Forest Grove. Rotary is an international service organization, with each club maintaining its own practices and traditions. Daybreak Rotary, for instance, focuses on literacy and donates a book in the name of each guest speaker who addresses the club at its weekly meetings, 7 a.m. Tuesdays at the Forest Grove Senior Center. 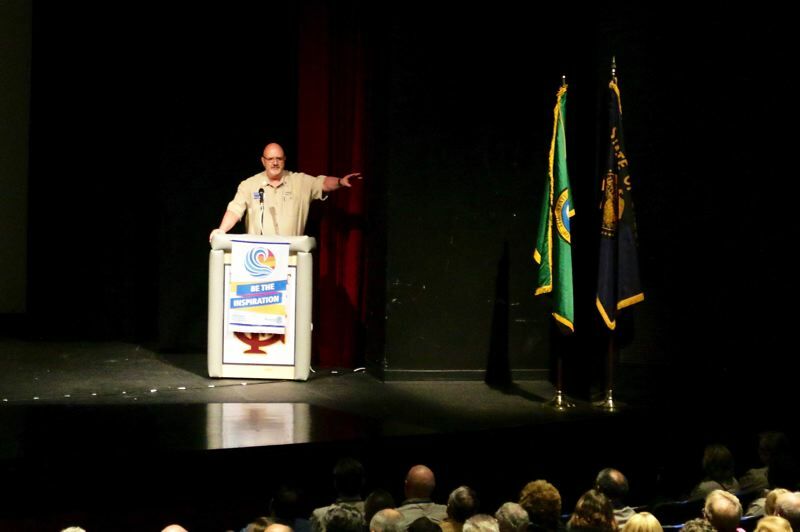 The reason why Forest Grove played host Saturday to the training assembly for Rotary District 5100, covering 72 clubs in northern Oregon and Southwest Washington, is because Forest Grove's own Larry Hatch is the incoming district governor. Traditionally, it's the role of the next governor to plan the district training assembly, and Hatch told me that he knew right away he wanted it to be in his hometown. "The high school was just a perfect venue," he added, noting its ample open space for tables, lunch facilities and classrooms for breakout sessions. Local Forest Grove businesses provided lunch, which Hatch said was the most popular part of the training assembly, according to surveys that attendees filled out. Overall, Hatch said the assembly was "outstanding," with likely more than 400 Rotarians attending part or all of the training event. Both the morning and noon clubs in Forest Grove pitched in with volunteers and resources to make it possible. "I'm very, very happy with how it went," Hatch said. Hatch will assume the duties of Rotary District 5100 governor on July 1, taking over from Renee Campbell of Salem.